Pet loss is often a grief dismissed by people who have not formed a deep bond with an animal, but those of us who have non-human best friend know the love and heartache that comes when a special pet dies. In the sixteenth episode of the Mindfulness & Grief Podcast we explore our deep love for our pets, why we mourn them, and how they can help us feel connected to our deceased loved ones when they are alive. Dave Roberts, LMSW, shares how two cats, Bootsy & Angel, helped him cope with the death of his daughter Jeanine, and how having these pets served not only as a comfort, but as living continuing bonds to his daughter after her death. He shares tips from his book about how to help children cope with pet loss, which is helpful for grown-ups, too. A frequent guest and blog contributor, David is always a joy to listen to, as he weaves in different and often unexpected perspectives of loss that can only come from wisdom gained from experience. Dave Roberts, LMSW, is an author and founder of Bootsy & Angel Books, LLC, and most importantly, the father of Jeannine, who died of a rare form of cancer when she was 18. Dave supports other grieving parents through his work with The Compassionate Friends, in his private practice, and through writing, speaking, and teaching in the psychology department at Utica College. Learn more about Dave at Bootsy & Angel Books, LLC., where you can also purchase his book on pet loss and holiday grief. Read David's Article, 3 Reasons Why Pet Owners Repeatedly Visit the World of Grief, and find him on Facebook and Twitter. Heather Stang: 00:02 Welcome to the Mindfulness & Grief Podcast. 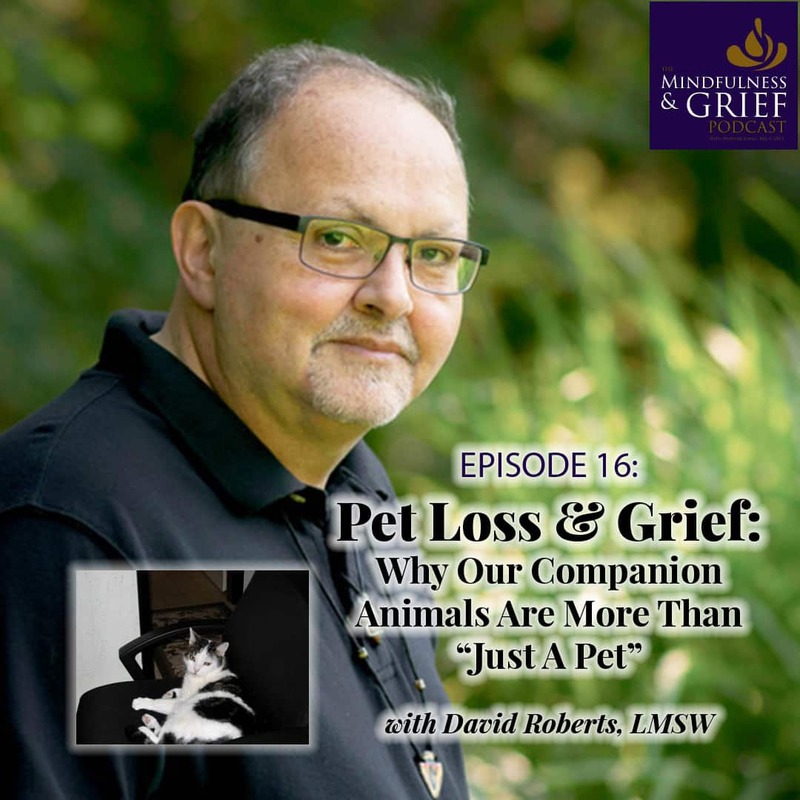 Today we will be discussing pet loss with Dave Roberts, an LMSW, grief author and counselor who also happens to be an adjunct professor in the psychology and psychology child life departments at Utica College. Great credentials here. He is also the father of Jeanine who was a very special young lady, still is a special young lady. She died in March 1st, 2003 so we're coming up on an anniversary. She was 18 and it's from this loss that has inspired Dave to help others walk the path of grief through programs like compassionate friends, and thankfully he is a frequent contributor to the mindfulness and grief community. He's graced us on the podcast and, and with his blogs, and you can learn more about him and his books bootsyandangel.com, and join his Facebook page. I would say search for Bootsy and Angel. I bet that's the only thing that will show up. And I think Bootsy and Angel can kind of lead us into this discussion of pet loss. Can you tell us who Bootsy and Angel are? Dave Roberts: 01:30 Well, Bootsy and Angel were two very special members of our family. they both have strong connections to Jeanine . Bootsy was a Christmas gift about, well he died in 2016 in his 21st year of life. So, you kind of figure about 24 years ago, he was a Christmas gift from one of Jeanine's best friends. And Angel was a rescue cat that we happened to find under the porch of a trailer of a mobile home park, and Jeanine and I both found Angel and we brought, we brought them both home. So hence that's where Bootsy and Angel books. The idea for the name came from, they were two of Jeanine's favorite cats. Bootsy died in March of 2016, and Angel died about three months after in 2016. So those two cats were the last two, four legged creatures that my daughter had a role in taking care of and nurturing, so when they both died, it was kind of the end of an era. Heather Stang: 02:31 Yeah. For so many of us, we've wound up with animals in our lives after someone has died. The first dog in my life was, Vera, Vera J. Animal, a small Manchester terrier that belonged to my uncle who died by suicide. And so Vera was raised by my grandmother, my uncle's mother. And when she, when she died, it felt, yeah, like the end of an era. It was the last "being" other than a human that was connected. And animals, of course, have such a different quality about them. You know we project a lot onto them, but they also give us a lot of love back. Dave Roberts: 03:15 Yes, they do. Our animals are all about love. They hold no grudges. There's none of these contracts that occur between members of the human race that get in the way of relationships. Cats and dogs just love you no matter what you do. Heather Stang: 03:32 Yeah. And that's what makes it so hard. Can you speak to that a little bit? Dave Roberts: 03:39 Yeah. I think for me, the animals that I've had and I've had dogs, I've had cats since I've been little. And probably one of the first losses that I experienced, in addition to my father leaving home, was the loss of the pup. And I think for most of us as children, the first loss that we experienced is the death of a pet. And I think the way parents handle that with their children, and honor that, I think sets the stage for how our children are dealing with grief as they advance throughout the life cycle. Bbut our animals are about just unconditional love, and they, they ask nothing other than to be taken care of, to be petted, to be nurtured. They don't ask for a lot. And one of the things is I could be having the worst day in the world. I could have the worst day at work. I could have had a blowout argument with my wife. For others, it could be, they could have had a relationship break up or they could have said something that they regretted later, but when they come home, that dog is just there waiting to love them up, and that cat is the same way. They're ready to just give us love. They know nothing else other than that. And that's why they're so special. Heather Stang: 05:00 I think sometimes that relationship, or the loss of that relationship, can easily be disenfranchised by people who have not had that type of relationship. I was just reading an article, a local man, he's, he lives in the same county is as I do, and he was feeling suicidal. His friend brought a Chihuahua over named L,ady. And that dog helped him survive that depression and got him out of bed, to the point where he's now start attempting to start a Chihuahua rescue. I think he has like 20 or 30 chihuahuas that have been abused or abandoned and he's this huge, hulky man. There's pictures of him with chihuahuas all over him. And you know, the reality is a dog saved this person's life. Dave Roberts: 05:56 After Jeanine died, Bootsy saved mine, because he would get me up, he would shadow me. He knew I was hurting. And I think there was some type of soul pact, between Jeanine and Bootsy that he was going to take care of me after she died. He got me out of bed when I didn't want to get out of bed. 4:30 or 5:00 o'clock in the morning he would get me out of bed and I would protest and say "Bootsy let me sleep." And he's meowing as is if to say, you know you've got to move. He loved me probably when I had trouble loving myself after Jeanine died. And that's something that when he died, that was for me, one of the more difficult losses that I've ever had to go through because of a significance, not only to Jeanine, but it's significance to me after she died. Heather Stang: 06:45 So what did you do to make it through Bootsy's loss? Dave Roberts: 06:50 Well, I'll tell Ya, you know, we've talked about serendipity, we've talked about signs from our loved ones. One of the things that we did, and I don't know if you can see this, one of the things that we did when we put him to sleep, we got a paw cast. So we took a cast of the spa. We spend as much time was we could, you know, towards the end with him. And when we took him to be put to sleep, my wife and I were there with him and it was still one of the more difficult things that I had to go through in my life. But let me tell you something, there was a lot of serendipity that brought me a lot of peace. Animals and children have a very distinct connection to the, to the other side that the veil between this world and the afterlife is very thin. And animals are very sensitive, to signs and to after death communication. And there was a time just after Bootsy was given the shot, the shot to put him to sleep permanently. He started getting up, he started moving and I kind of figured, well, maybe he wanted to stick around for a little while, but he was moving forward and he was looking up at the sky. And I really believe at that point my daughter was there welcoming home. Because when he was alive, he would see my daughter's prayer card on the refrigerator, and he would start scratching at it and meowing at it, which told me that their connection was still a strong. Dave Roberts: 08:25 Interestingly, after his death, there were three crows that, that we're kind of calling in unison. We took Bootsy home and we buried him in the backyard. So they joined being in kind of our tribute to him. And what was interesting is that it was Easter Sunday morning, and I'll never forget this, I kind of said a prayer. I said a prayer to crow to just tell Bootsy how much I love him, how much he meant to me, that he would always be in my heart, and the moment I can completed that prayer, three crows flew off into the distance. Birds are the bridge between heaven and earth. Anyway, they're the messengers between this world and the next. And when I saw that that was immediate validation. So a lot of prayer, but also a lot of validation from our other friends in the animal kingdom who told me that they had this covered, they had our backs and they were going to take care of Bootsy. So that gave me a lot of joy and a lot of peace. I still thing about him, we have pictures of him all over the place and they still say hi to him every morning. So, you know, he's still a part of our lives, as with Angel as well too. Heather Stang: 09:48 Sure. And an Angel died just three months later, which is suffering on top of suffering. Dave Roberts: 09:57 We kind of figured that if Bootsy died, Angel was going to go. We just kind of figured they came, they came into our homes about a year and a half apart, but they had always been connected. And you know, my wife and I kind of figured that after Bootsy crossed over that Angel would, would be be next to go, but it was a short period of time. I almost think that she, she knew and she said, I want to be with my partner. So I think there are rapping right now somewhere over the rainbow bridge, pain free and you know, with my daughter. Heather Stang: 10:31 Probably watching us and since their cats, they're probably formulating opinions about what we're saying. Dave Roberts: 10:37 Yes, they probably are. They probably are, and they're consulting to make sure they're on the same page. Heather Stang: 10:43 Absolutely. And you know, so many of us get those signs, after people or animals die. For me, I have had several animals in my life die. The most recent one was my dog Brandy who died exactly one week after my stepfather died. And a couple of days after I'd shown her his body, and part of me for a bit felt like - we'd forgotten she was a sick dog. She actually had a diagnosis, but was on medication. And we, we didn't even think about the fact that she was 16, you know, because she didn't seem it. And so when she died a week after her alpha dog, it was quite a shock, number one, because she was providing me with a lot of comfort, and it was incredibly, incredibly painful. And I remember reading in my stepfather's obituary in the paper, someone, who I'm sure was well, meaning had written a comment under his obituary that said, "don't worry Tom, brandy will be along soon." And I was so angry, you know, I was so angry. I was like, who would write that? And then of course she did die. And I think in a way she'd been holding on for him. And she probably was just exhausted. And she did die just naturally. We didn't need to put her down. She just died in her sleep. But anyway, after, after that I got, I had asked a friend during a yoga therapy session I want, I said I wanted a sign that the Brandy & Tom were okay. And this is legend for the people who were there, because thank goodness I have witnesses. But we went out in the backyard after the yoga therapy session, and a rainstorm came and a rainbow appeared and disappeared in the back yard three times. And I have a picture of my friend standing in the rainbow. And for me, that was probably the first sign that I felt, how can I dispute this? Dave Roberts: 12:56 You can't. That's immediate validation. Heather Stang: 12:59 Yeah. And so strange because you could actually touch it. It was right there. It was so immediate. That was beautiful. So I think the theme that you and I are riffing on here is that one of the things that can get us through pet loss is finding, seeing, receiving the signs that the love lives on. Heather Stang: 14:49 Which is a technique we use when a human person dies in our life has that idea of what imprint have they left on you? What mannerisms, what behaviors, what interests, what hobbies? Those kinds of things so that you can still feel connected to them. Because feeling connected is helps assuage some of the deep pain. It's a way of, not necessarily saying their name, but honoring their memory by being with the gifts that they've given. Dave Roberts: 15:25 And sometimes just completing what they didn't have an opportunity to finish. That's another way that we honor as well. Heather Stang: 15:34 So a question that that I had for you is how can parents help children through pet loss? Dave Roberts: 17:45 Well, there's a, there's a few things that parents can do that can be helpful and if you'll let me indulge, I will read a few pointers out of a pet loss book that Linda Findlay of Mourning Discoveries and I wrote several years ago. It's called Mourning Discoveries: A Guide To Help Families Navigate Through Grief Towards Healing And The Loss Of The Pet, and the information for that as also on my website and the online store as well too, for anyone interested. Let me just read some things from page 11 of the book in terms of some tips for parents to help their grieving child. Give the children permission to work through their grief in a way that's meaningful. Everybody grieves differently. Children grieve differently. Depending on their age. They may want to draw a picture of the pet. They may want to have one of favorite toy buried with their pets. Give them an opportunity to participate if they want to do a funeral service for the pet, whether it's a Goldfish, whether it's a dog, whether it's a cat, there's a rabbit, allow them to do that. That will help, one, validate that their grief is important. Secondly, begin at a young age to teach them healthy ways to mourn and to grief. Dave Roberts: 19:08 If they're going to school, let the teacher or daycare providers know that they just experienced the death of a pet. Kids can exhibit symptoms that are very similar to ADHD, and not have a history of ADHD. Symptoms of grief such as group for children can be distractibility, irritability, and inability to sit still. If there has been no prior history of ADHD, the teacher or daycare provider, really ought to just check and see what's going on in the home, because usually there's a change in social situation. There is a death that could account for that behavior. Encourage the child to talk freely about the death that occurred, and create a sacred space where they can do that. Be honest. Discuss grief, don't use euphemisms. Don't say, "Fifi has gone away," because depending on the child's age is going to wonder when is Fifi coming back. So try to explain the finality of death and as age appropriate why as possible. Include the child in everything that is going on. That may also include decisions about putting the pet to sleep. We had a golden retriever. This was many, many years agol. She had developed cancer, she had develops in neurological difficulties. So we had to make a quality of life decision. So my wife, Sherry and I included our entire family in the discussion. Dave Roberts: 20:39 And we made the decision that, to prevent Ginger from further suffering, that we would instruct the vet to put her to sleep. So what that did was allow each one of us in the family to spend some time individually with her, our children included. So make sure that to the extent possible they can be part of the discussion. The other thing, if they wanted to do something to memorialize their pet, put together a picture board or a collage of pictures, let them do that as well too. So it's basically just giving children an opportunity to express their grief in ways that are meaningful. The other thing, don't say things like, well, we can always get another pet, because you can't always get another pet. It's like somebody, you know, who a parent, a mother has lost a child due to a miscarriage or a newborn death. We can always have another child. I mean, that's probably one of the worst worst thing you can say to a parent under those circumstances. And what it does is it undermines the significance of the loss that they already have. Pets usually find us. And we do get pets over time. We do replace our pets, but that's a decision that the pet owner will make when they're ready. Or a pet that they see at the humane society decides "I'm picking you as my new human." So, so other than that, it's whatever's going to work, and whenever they're ready for another pet. Heather Stang: 22:05 And all of that is, like you said, teaching good grief skills for the pet and beyond, for how we respect the relationship. And the relationship is about the perspective of the person who's had the loss, not the perspective of the person looking in. And for so many children, and for many of us adults, those are so significant. So very good advice. Dave Roberts: 22:31 And as you mentioned in the beginning of the show, pet loss can sometimes become come disenfranchised because somebody will say, well, it's just a pet. You can get another pet. But you also look as we look at the significance of those humans in our lives who have died, we look at the significant of the relationships that we have with our pets. For some people who can't have children, their pets are their children. Pets might have come into a time where both husband and wife we're dealing with empty nest, and they provided some comfort for that. if you have a pet that's in an emotional support animal or a service animal, that takes the relationship to a new level. The other part of that is if the humans in our life pre-decease the pets that they were connected to, as in the case with Jeanine pre-deceasing her two cats, that could bring up a whole wave of grief. That association could also restart the shadow groups that we, that occurs early on after our loved ones die. I actually used to call that the Bootsy and Angel Effect, that if there were humans that pre-deceased their animals, and then the animals died, that connection, grief could occur on both levels with reliving the human loss and also reliving the current loss of your pets that they were connected to. Heather Stang: 23:59 It's like a domino effect. I think about my, I mentioned to you that my dog just received a diagnosis, not something where it will necessarily play out soon but it will play out. And I was thinking back about when he came into my life, and it was right, right around the time, probably about a year after Tom and Brandy had died and I was sure I would never love again. You know, it was just like, I'm done. There will never be, you know, and then the dog comes into your life, and like you said, they choose you in a way. And so just thinking about my current dog's end of life, which brings up all sorts of anticipatory loss feelings, it takes me back to that time, and it's kind of interesting cause it's this beautiful legacy of love, but they're connected in ways, even though they never met each other, because of the theme of love that it's played in my life, if that makes any sense. Dave Roberts: 25:02 That makes perfect sense to me, and every pet that we, we, you know, we buy every pet that we adopt. They build on that theme of love cause that's what they're about is love. Heather Stang: 25:13 And back to age appropriate. You were mentioning that earlier and that's something we always think about with children. In the early years, children don't see loss as permanent. In fact, they can see it as reversible. My friend and massage therapist, sadly they just had to put their rottweiler to sleep. And, and her young son who's probably about, I think six years old, wanted to know if they could go get him from the backyard. And that's so hard. It's so hard. Recognizing that even if you are trying to be as clear as possible, they may not be able to cognitively understand yet, that this is a permanent. Dave Roberts: 26:09 Which is why it's kind of important to try to explain that to the extent that I can understand that either, you know, their body stopped working. He's not breathing anymore. You know, something to that effect and try to explain that from a very concrete standpoint. Things like, Buddy went to sleep or he's gone away. If you do that with human loss with a child they'll want to know when's he coming back, when is he going to wake up? Or they may be afraid that if they go to sleep they won't wake up. So, it's really important to try to, to really help them understand the finality of death in an age appropriate way. And I know there's probably, there's several good age appropriate books I'm sure for pet loss. I think one was written by Bernie Siegel I think, I forgot the name of it, but it sets a Bernie Siegel of book. Dave Roberts: 28:09 I know Linda. Heather Stang: 28:10 Everybody in grief does, she's just a wonderful woman. I was like, oh, I'd love to come to your workshop on children and pet loss, but I don't think I could handle it right now. And Linda says, well, what was your dog's name? And I was like, oh, Woody. And she goes, do you have a picture? And I pull out a picture. Next thing you know, I'm sitting in the workshop and she's using me as an example of how you work with children. Dave Roberts: 28:37 Yeah, let them bring in a picture. Let them tell you about the dog. Heather Stang: 28:37 And so it, you know, it doesn't matter how old you are, the techniques for working with children and pet loss I think are, at least I want to think that it's still relevant since, you know, I'm about nine years old when it comes to this. Dave Roberts: 28:52 Well, if you look at how we deal with companion individuals who experience a loss, we ask them for the same kinds of things, can we see a picture? Would you mind showing us the DVD of some of your highlight moments with your loved ones. So, I mean, that's basically the same principles. You know, we're just, he just takes different shape as we grow and develop. Heather Stang: 29:12 I think the difference with pet loss than human loss, again, is that disenfranchised element, and the fact that I think you can feel, I mean, it's hard enough to talk about grief when it's a human, it's hard. It opens you up, unless you're in a safe space. And to think of having to go back to work. And I know I have definitely disenfranchised own loss when it's come to pet loss. Who do I tell? Who don't I tell? Are they going to judge me around how incredibly attached I get to my pets because I was an only child. That's my sibling. Dave Roberts: 29:55 And for our children being out of the house now, these are our two children. These are who we are now responsible for nurturing. So our pets have significance in the structure of our entire family. They're just part of our family. However family tends to be, the other piece, you know, is that we share a lot of the same DNA with dogs and cats. With dogs, I was reading reading an article, we share about 90% of our DNA with dogs, no 90 with cats. 84% with dogs. Heather Stang: 30:30 How is that possible? What? We are more cat-like than dog-like? Dave Roberts: 30:33 Pretty much. Heather Stang: 30:39 That is a shock. Dave Roberts: 30:40 That is a shock. But if you'll look at it, the fact that we share the same DNA, we're truly not as different as we're all made out to be. I think that's part of the other connection. If we share the same DNA, we attribute to human qualities to our animals. We look at them as really having human qualities, because we do share the same thing. Heather Stang: 30:59 And it's attachment. Anything we attached to, we can grieve. Dave Roberts: 31:04 That's why you've seen fellow pet owners dress up their pets. That's one of the reasons that we attach to them. I mean, I haven't done that, but I, know other pet owners that get a lot of joy out of doing that. But it's part of the human qualities that we attach to them part of that whole attachment and part of the fact that they are our family. Heather Stang: 31:22 Well, thank you for spending time validating this really important relationship and issue. As we kind of move into the close of our time together. Are there any other tips or resources that you would like to share with our listeners? Dave Roberts: 31:40 There is a great website, Rainbow Bridge, that deals with all things pet loss. I think they have a list of support groups. They have resources. There's also funeral homes that do a lot of stuff with with pet loss. If you want to get a token, or some pet owners will have the cremains of their animal that made into a bracelet, or made them something that they can take with them. Those are the things, don't hesitate because we're in all likelihood we are going to live most of the animals that we take into our home. They deserve to be honored and memorialized as much as our human counterparts because they play such a significant role in our lives. So honor and keep the connection with your cats as you do with your loved ones. Heather Stang: 32:38 And your dogs. Heather Stang: 32:46 Full disclosure, you can tell that Dave owns cats and I own dogs. Well I've had cats. Dave Roberts: 32:49 I had dogs early on in life. But I love dogs anyways, so I apologize to any dog owner. Heather Stang: 32:58 That's fine. And you know, and there are other animals too that that people attach to. So I won't run through the list of the animal kingdom. Well thank you Dave Roberts again for joining us. You can find him at bootsyandangel.com, and is there anywhere else we should be letting people know they can find you. Dave Roberts: 34:32 They can email me if they want at BootsyandAngel@gmail.com. I almost forgot my own email address for a minute. They can also find my personal page on Facebook, and you know, certainly I will accept your friend request as long as you are not a bot or anything like that. Especially if they're mutual friends or you and other people in the grief world. I usually readily accept those. I'm not going anywhere. They could find me on email and can find me online. They can find me on Facebook. Heather Stang: 35:05 And you blog on Medium, correct? Dave Roberts: 35:07 I blog on medium. I do a variety of different publications for them. I've contributed an article to a, to MindfulnessAndGrief.com, I already also emailed Marcia and let her know that I uploaded another one in draft form and she continually looked at it. Dave Roberts: 35:32 Third podcast, and there are a couple articles. So, you know, I guess I'm part of the mindfulness in grief family at this point. Heather Stang: 35:41 You're absolutely are. Well, thank you again. I appreciate all you do for those of us who have heartbreak from people and animals and who have love for our people and our animals. Dave Roberts: 35:57 So then likewise, I appreciate what you do to help the grieving community through mindfulness, through yoga, and just for your presence. Heather Stang: 36:03 Thank you Dave. Namaste. Dave Roberts: 36:06 Namaste to you too.